St. Peter’s Greathouse & Botanical Gardens is a full-service wedding and reception venue. Locals and destination couples love this place for getting married because it has everything you need to plan your wedding day. The venue itself is spectacular. The Greathouse sits high on a the island over 1,000 feet above sea level. 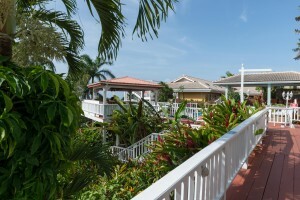 It boasts views of Magens Bay below and over a dozen islands in the distance. A gazebo sits on the top level and you feel like you are on top of the world. The breezes up here are constant and will keep you and your guests pleasantly cool throughout your ceremony. Seating is available for 100 guests and more. An enormous air-conditioned ballroom with seating for over 400 guests for your wedding reception is just steps away from the gardens. The catering is all done in-house and the team can arrange incredible sit-down dinners and more casual buffet style meals or even walk-around appetizers. 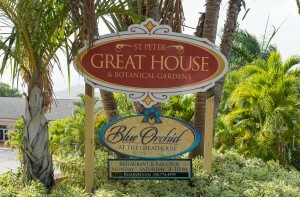 Blue Orchid, an elegant fine dining restaurant, is located on property if you don’t need all the space in the ballroom. St. Peter’s Greathouse has plenty of room (over 20,000 square feet) for your wedding guests to move around the vast grounds. And this doesn’t include the botanical gardens. s provides great photo opportunities among all the orchids and tropical plants. If you decide on having your wedding reception in the ballroom, there is a large dance floor. Or, you can dance under the stars on an outdoor patio with a full-service bar. Whether you decide to have your reception indoors or out, there is plenty of room for your guests and a band or DJ. The expert service staff at St. Peter’s Greathouse has experience hosting black-tie events, corporate events and hundreds of weddings. The venue also boasts a wide selection of in-house decor options so you can easily implement your wedding theme and vision. Parking for cars or taxi drop off is generous. There are dressing rooms available for the bride and groom and their wedding party. Photo opportunities abound at St. Peter’s Greathouse whether on the observation deck, the botanical gardens or all of the nooks and crannies of this enormous property. 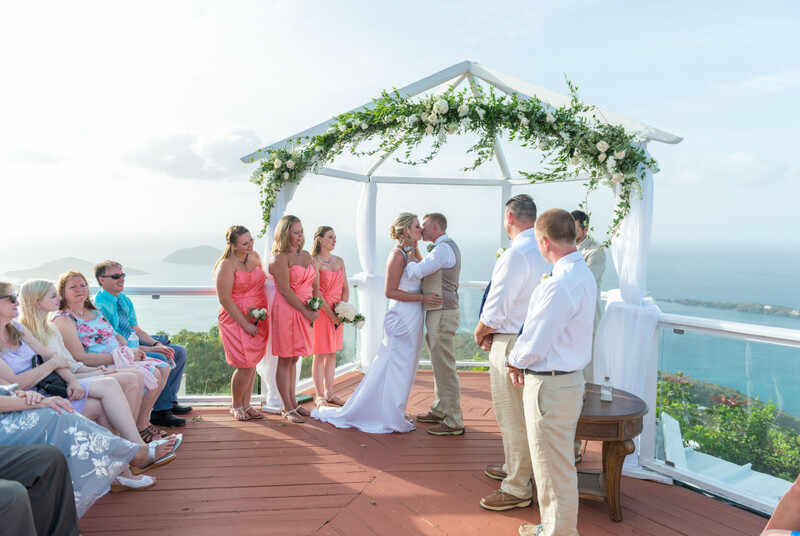 St. Peter’s Greathouse is a premier wedding venue in St. Thomas and offers endless possibilities.